Little brings out the child in me like the term Glow in the Dark. Instantly, I am a Teenage Mutant Ninja Turtle loving, Captain Planet theme song singing, G. I. Joe playing, Hulkamaniac rooting, baseball card trading kid with absolutely certainty that I was going to be the world’s first Astronaut Forest Ranger. Life was easier back then. We may not have had the internet like it is today, but we also didn’t have the TSA groping our wiggle bits and an addiction to text messaging. In the Starlite review, I already disclosed my experience with Glow in the Dark retail items when I was a young adult so now I am going to delve back farther. When I was a kid, if it was Glow in the Dark, it was a must buy. I remember how it started. I was going through some boxes in the garage when I found a boxed version of the old text based game called Wishbringer. Wishbringer was a branch off of the text based game Zork, and Zork back then what World of Warcraft is today, except not online and no graphics. The game also came with a small glow in the dark “Wishbringer” stone. This was my first exposure to GITD items, and you might have thought I stumbled across the answer to life, the universe, and everything. It went to school with me, to church, on my nightstand, and soon my room was covered with glow in the dark stars and black lights. I was one Pink Floyd poster away from the swat team busting in to look for drugs. Over time the stone got dirty and glowed less and less. Just like my obsession with glow in the dark items, overtime it faded out. When I look at the “GlowNasty” and see how bright it is in even dim light it instantly takes me back. When the GITD Die-Nasty showed up in the review package from YoYoFactory, it was the first thing I showed to my daughter. Immediately I could see the wheels turning in her head. She thinks its “really cool” and since I have two, she wants one for “her room”… and the cycle starts anew. I said it in the Starlite review, and I will say it again here. In regular light, the Glow in the Dark plastic YoYoFactory uses looks like week old key lime pie…. but once you get in the dark and the Die-Nasty is glowing more fiercely the full moon, you suddenly see it in a new light…wait… yeah, I’ll stick with that. Despite its lunchroom leftover demeanor in daylight, the GITD Die-Nasty has a very nice minimalistic branding on each cap and actually feels sturdier than its Grind Machine cousins. The caps sit right behind a lip, but can be removed if you use the axle to pop the axle nut up. I don’t know for sure what YoYoFactory is doing to package the GITD Die-Nasty. The ones I received came in poly bags. YoYoFactory took the hand inviting body of the plastic Grind Machine and put on side caps instead of weight rings or hubstacks. I never got a chance to get my hands on the original Die-Nasty. Using the specs available to me, it looks like the Glow Die-Nasty is about 4 grams heavier than its non glow counterpart, and has a pitted finish that emulated bead blasting. I have a feeling that the extra weight can be directly attributed to the material used. This GITD plastic seems to have a higher density than plastics normally found in plastic yoyos. I popped the cap off one of the halves to see if there was a weight ring hidden. There is not. However, the cap has a very thick outer rim which acts like a weight ring. By itself, the caps are approximately 3 grams each. This brings the Glow in the Dark Die-Nasty to the northern end of the 60 gram spectrum. The h-shape catch zone is “bead blasted” until about two thirds in. From there, the plastic is shiny and smooth. The response and bearing setup look similar to the standard plastic Grind Machine. A set of spacers hold the C sized Center Trac bearing in place and a response groove for CBC pads looks like it might be able to hold followable silicone. Like all other plastic YoYoFactory yoyos, the GITD Die-Nasty has arrows on the rim to tell you when the yo-yo is screwed together at the correct position. I honestly with every yo-yo maker that produced plastic yo-yos would do this. 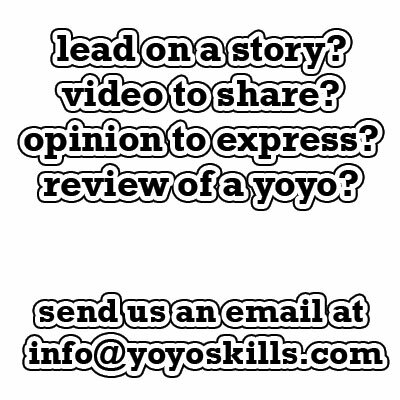 The axle nut is metal and the body of the yo-yo is plastic. If you crank to hard, the plastic nut capture is going to strip. This is why I am a big suporter of the arrows. 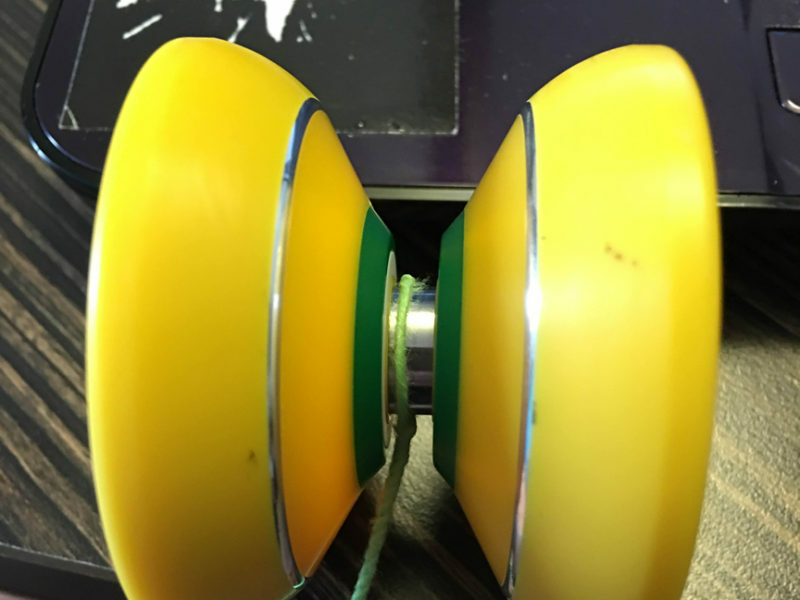 They are there for a good reason, and should help increase the longevity of your yoyos if you are the type that like to open your toys up often. I always loved the shape and feel of the plastic Grind Machine, but did not like how much center weight the hubstacks added. Here on the GITD Die-Nasty, the caps have focused most of the weight at the rims which gives the GITD Die-Nasty a solid but floaty feel. I think this is partially due to the unique feeling of this particular plastic. It seems to pick up on any mistakes you make. If you zig when you should have zagged, the GITD Die-Nasty will know and you will find yourself with considerably less spin. The basic catch zone shape is fairly easy to work with, and there were no struggles to speak of when hitting the zone with a whip or hop. At the end of the spin, the yo-yo tended to tilt a bit prematurely but once you now this, it is easy to compensate for. On a good throw, the GITD Die-Nasty can offer moderately stable performance with little errant movement, but once the spin dies down you have to pay attention to ensure a clean return. Both models sent to me had a slight bit of vibration. I know this hits both sides of the fence regarding vibe on yoyos, but my preference is to have a yo-yo spin smooth and silent. Grinds were actually pretty good. The simulated bead blast finish rides the arm nicely and steadily. You’re going to want a hard throw to grind and have enough spin to finish off your combo. The plastic/weight configuration/ finish seems to rob spin time when it comes in contact any sort of obstacle. All in all, the experience with the Glow Nasty was a fun one. 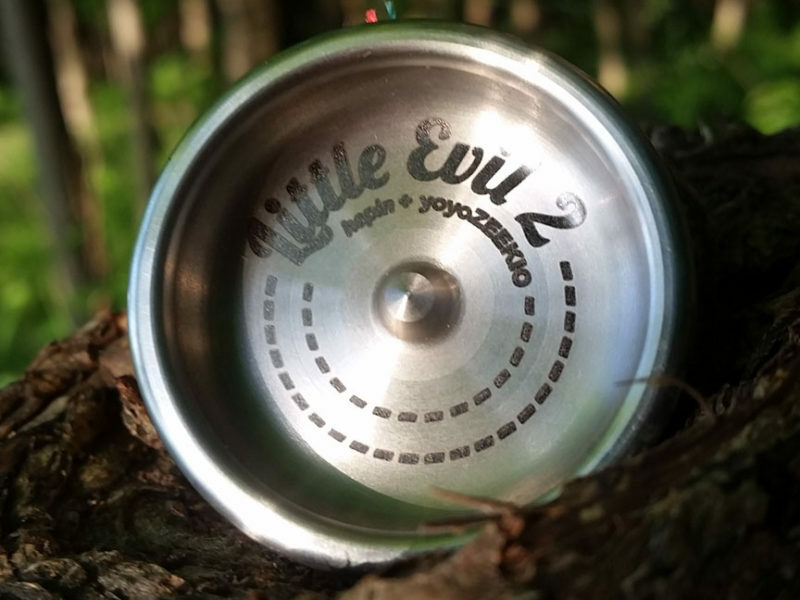 If you prefer the Grind Machine feel to the Protostar shape, then you would be hard pressed to find a yo-yo that performs better in the dark than this one. At $25 dollars, you are basically paying a $5 dollar premium for a heavier, GITD Die Nasty. If you want a great yo-yo that also glows in the dark, you can’t beat the playability and price point of the YoYoFactory Glow in the Dark Die-Nasty. Written by Chris “Dr. Yo-Yo” Allen who secretly still carries his Wishbringer stone everwhere he goes, in his heart…. My only criticism here, and correct me if I’m wrong… but wouldn’t this be considered a butterfly, and not a wing shape? If Darth Vader had a yoyo it would be the Die Nasty.